In 2007, Hamas seized power in the Gaza Strip in a violent coup, overthrowing the Palestinian Authority (PA) and creating a rift between the two main Palestinian movements that lasts to this day. In the years that followed, Hamas turned its enclave into an Iranian-backed armed base and used it to terrorize southern Israel for years. In response, Israel placed the Gaza Strip under a security blockade, which has changed in form throughout the years, but which is still guided by one central goal: To prevent Hamas from being able to conduct a massive military build-up program. Since taking over Gaza, Hamas's armed aggression against Israel has led to three armed conflicts, which have only increased the suffering and misery of Gaza's estimated 2 million people. Throughout this time, Hamas's relations with other regional players, namely, the Palestinian Authority and Egypt, hit rock bottom. While international attention often focuses on Israel's security blockade, as well as attempts by Gaza's factions to break through it, less notice is given to the way Egypt and the Palestinian Authority (PA) have isolated Gaza throughout the years. Gaza's near total regional isolation and economic distress continue to worsen, to the point where Hamas today fears that the Gazan economy could simply collapse, sparking a revolt and threatening its rule. In such a scenario, Hamas would likely choose war against Israel as a last ditch effort to distract attention from its failings as a government. Throughout this complex and explosive situation, Israel's defense establishment has been taking steps to try and keep Gaza's economy from collapsing. Israel Defense Forces (IDF) officers who deal with Gaza actively encourage the Strip's business community to grow, increasing the number of permits for them to leave Gaza, and fostering Gazan exports. They also keep a close watch over the state of Gaza's vital civilian infrastructure, in a bid to keep it running. Israel keeps a daily supply of a variety of goods, fuel, gas, medical equipment, food, and construction material flowing into the Strip. But these steps are not enough to defuse the time bomb that is Gaza. Now, Israel's defense establishment appears to be open to the idea of further improving Gaza's civilian economy, but only if this can be done without allowing Hamas to step up its dangerous military build-up programs. As Israel weighs up how much it can relax the blockade without risking its security, the Palestinian Authority – driven by a desire to punish Hamas for splitting off from it, and for maintaining its own, separate armed force – continues to place its own sanctions on Gaza. The PA has cut salaries to its personnel in Gaza, sought to reduce the electricity flow (and was pressured by Israel to reinstate electricity payments last month), reduced medical assistance, and generally put the squeeze on the whole of Gaza. Israel's dilemma here is complex. If it sends generators into Gaza to help with the energy crisis, past experience shows that many will end up in Hamas combat tunnels, which are dug in the direction of Israeli communities for the purpose of attacking them. Still, Israel's defense establishment recognizes the need to do what is possible to develop Gaza economically. The PA, on the other hand, is unwilling to contemplate such a course of action until Hamas surrenders to its demand of disbanding the military wing. PA President Mahmoud Abbas is determined to keep Gaza in economic lockdown as long as Hamas continues to 'rebel' against him. In recent months, an attempt by Hamas leader Yahya Sinwar to break out of isolation by holding reconciliation talks with the PA, came to nothing, because Hamas is unwilling to hear of disarming. From the PA's perspective, that means it will continue to try and choke Gaza. Abbas refuses to accept any deal that would leave Hamas operating much like Hizballah does in Lebanon. That means that Abbas rejects the idea of Hamas monopolizing military power, while allocating some symbolic political power to a wider government. The real hatred in place between the PA and Hamas is too deep to bridge, and Abbas is activating his main weapon against Hamas as a result: Withholding money from the Gaza Strip. It is Abbas's main available maneuver, and he is using it on a daily basis. For its part, Egypt has kept its border with Gaza shut most of the time. The border is opened so rarely that when Egypt does open it, it makes news. Egypt has now opened its Rafah crossing with Gaza for the month of Ramadan, representing the longest period that Gazans have had to pass through in years. The move might signal the start of a more lenient Egyptian policy, which until now has seen the Rafah Crossing sealed shut. Egyptian President Abdel Fattah El-Sisi's administration views Gaza's militant Islamist rulers as a direct threat to Egyptian national security. This situation threatens Hamas's ability to pay for its armed wing and challenges the Hamas government's future. It also leaves the people of Gaza feeling hopeless. When it established a government in 2007, Hamas became the first sovereign Muslim Brotherhood regime that controls a territory. To endure, it must find a way to break out of its isolation and allow the money to start flowing into Gaza. With the PA so far ruling out any cooperation on this front, that leaves Egypt and Israel as parties that could potentially ease the blockade. That can only happen, however, if Hamas agrees to roll back its guerilla-terrorist army build-up. If Hamas is able to convince Egypt and Israel that it is willing to do this, a situation might arise in which the Israeli and Egyptian blockades on Gaza might be eased. Egyptian, PA, and Jordanian foreign ministers and chiefs of intelligence met in Cairo last week to look at ways of dealing with the unfolding Gaza crisis. The meeting follows the biggest security flare up since 2014. In recent days, Palestinian Islamic Jihad – the second largest armed Gazan terror faction, and the closest Palestinian organization to Iran – together with Hamas fired more than 150 mortar shells and rockets at southern Israel, and the Israeli Air Force responded by striking more than 65 high value enemy targets. In this flammable, complex Middle Eastern maze, Gaza's civilians continue to pay the price. 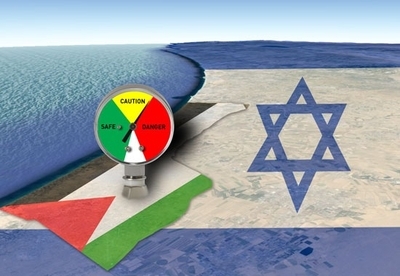 The near future will indicate whether this chronically unstable situation will collapse into another conflict or whether Gaza's economy can be pulled back from the brink, thereby preventing war.